You’ve got to appreciate a company that doesn’t give up even when things are looking down. Despite a rocky launch plagued by delayed shipments, unfinished software, and a laggy camera app, Essential has done an admirable job of turning an over-hyped (and expensive) phone into something you might actually want to buy. And now, even in the face of a reportedly impending sale, Essential is still teasing stuff like this: A new accessory for the PH-1 that delivers high-fidelity MQA audio rendering, a built-in digital-to-analog converter, and a handy headphone jack—all in a little mod that magnetically clips onto the back of the phone. With this accessory, Essential is also pitching a free, three-month trial for Tidal, which as you’d expect uses MQA rendering to deliver better-quality music than more popular services like Apple Music or Spotify. Those two little holes in the top right is where the new audio mod connects to the phone. While the price of the new MQA audio mod is unknown (it hasn’t showed up on the Essential store yet), its arrival suggests that Essential still has some gas left in the tank. The mod is just the second accessory for the Essential Phone that takes advantage of the phone’s semi-modularity, the first being the 360 camera mod that was available shortly after launch. 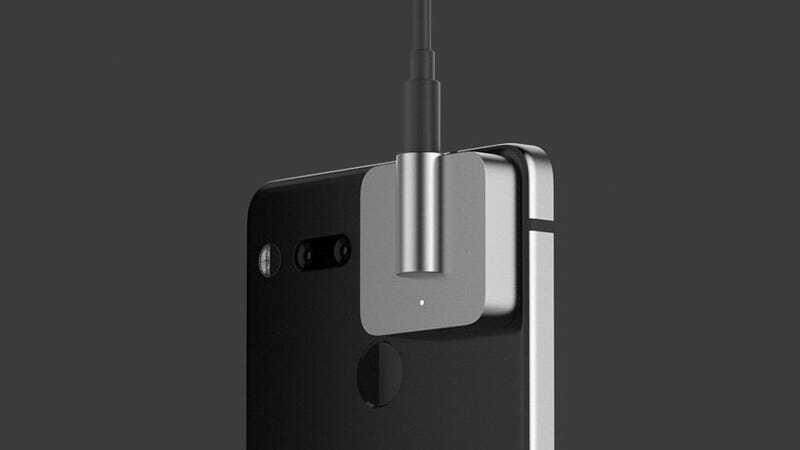 Originally, Essential had a whole ecosystem of accessories and add-ons planned to be used with the magnetic pin connector on the back of the PH-1, including a wireless charger and others. And then there’s the yet-to-be-released Essential Home, which was supposed to be a smart home assistant that functioned like a souped-up Echo Spot. It’s encouraging to see continued support and development for the Essential phone because after its early troubles, it would have been so easy to give up. But with a price drop from $700 to $500 (or less depending on sales), monthly AMA’s with its customers, and support for the next version of Android, Essential seems more committed than a lot of companies to the happiness of its users. Hopefully, Essential gets a chance to release a second device. After all, a lot of good ideas went into the PH-1, including its gorgeous minimalist design, super clean install of Android, and of course, that notch, which was the birth of the biggest (and possibly most controversial) trend in smartphones right now.